Topsy-Turvy Transit: Where Do We Go From Here? This has been a tough year for AATA. What was supposed to be a walk in the park has turned into something more like a ride on Space Mountain. And The Ride hasn’t finished with the possible surprises and upsets. As we documented early on, the AATA board settled on a plan to launch a countywide transit authority at a retreat in June 2011, and released its first version of the Transit Master Plan in August 2011. The process laid out was complex. 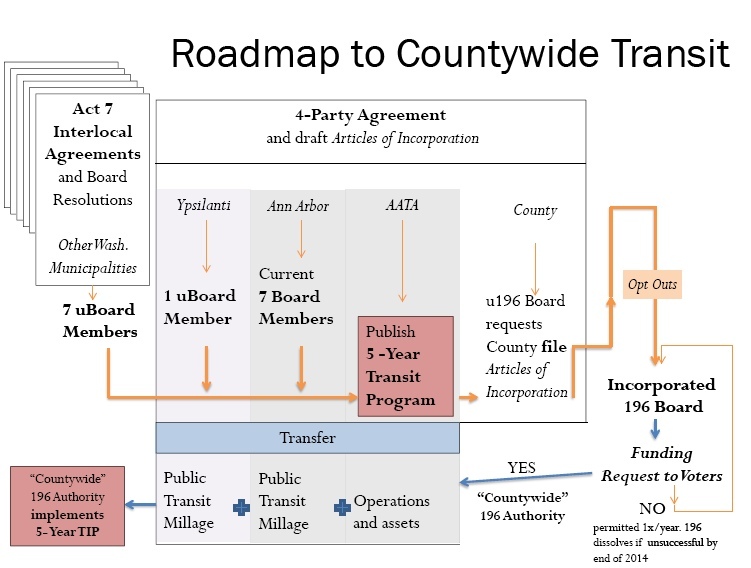 It required participation of all units of government in Washtenaw County to appoint a 15-member board that would serve as an “unincorporated 196 board” (u196), execution of a very complicated legal document that would result in the city of Ann Arbor dedicating its charter transit millage to the new authority, and approval by the voters countywide of a new transit millage. The “catapult” consisted of advance implementation of a number of new services that were presented as part of the countywide plan. The choice of term was perhaps unfortunate, since it did indeed “catapult” AATA into its first acceleration to the top of the mountain. The first jolt was felt in October 2011, with Governor Snyder’s announcement of his new transportation initiative, which included a Regional Transit Authority for SE Michigan. It would include Washtenaw County. We reported on this in detail in a post that described the reaction of Albert Berriz, the chair of the Financial Task Force. The FTF had been appointed by the AATA to come up with a financial plan for financing the TMP. It had its first meeting on October 28. Snyder had given his talk on October 26. Berriz was clearly stunned by the implications of the RTA (especially its control of state and Federal funds) and rather summarily canceled most business of the FTF, postponing the next meeting for a couple of months. But AATA staff and board seemed sanguine and pressed ahead with their plan despite this large dose of uncertainty delivered by the Governor. 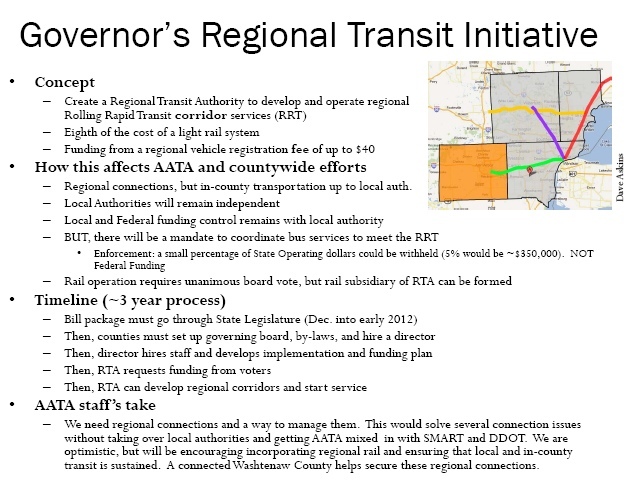 They came up with a reassuring interpretation of the effects of the RTA on Washtenaw County’s transit plans as being minimal. Apparently these were based on conversations (the text of the legislation was not yet public). Many details are now clearly understood to be mistaken. And they pressed on with their original plan. The FTF appointed a subcommittee of very knowledgeable people who did a very high-level job of analyzing finances needed for the TMP. By considerable fudging (they simply omitted many facets of the plan from the financial estimates) and raising fares, they were able to recommend a county-wide millage of only 0.5 mills (this was later recalculated to 0.584). But just as they were poised to present this to the full FTF, Governor Snyder’s package of bills were made public and the roll-out was again postponed. Finally, the FTF met on February 29 and released their recommendations. A complete set of these reports and recommendations is available on our Transportation Page. The chair, Albert Berriz, wrote a letter to the committee that was telling. …we don’t know what the Governor’s plan will look like in its final form, and without that information it’s difficult to say that pursuing the track of a countywide millage is the right thing to do at this time. Therefore, in my opinion, it’s premature to pursue any millage option at this time…as there are too many parts of the current economic model that we have been asked to review that may and likely will change once the final legislation comes into play. Meanwhile, in the background, serious discussion was going on in Washington D.C. about the fate of Federal transportation funding. The then-current transportation bill was on life support after many short-term renewals. Finally, on July 6, 2012, MAP-21, the new transportation bill, was signed into law. Regulations and funding schedules have been generated on an ongoing basis. (For excellent coverage, see Transportation Issues Daily’s MAP-21 Learning Center.) During much of 2012, AATA did not know how Federal funding (a very important component of their overall financial plan) was going to settle out. So, let’s summarize. The AATA was proceeding on a number of assumptions. The elected officials of all the units of government in Washtenaw County would assent to being included in a new scheme that included a likely new tax and a governance model that left Ann Arbor mostly in charge. Ann Arbor, the city of Ypsilanti, and Washtenaw County would all sign off on a couple of fairly substantial legal documents. The RTA either would not materialize or would not affect them significantly. The voters across the county would vote in a new property tax, including in both tax-adverse rural townships and the voters of Ann Arbor and Ypsilanti, who were expected to add this millage to one already existing. Changes in Federal transportation funding would not affect them negatively. To all of these challenges, the response was to press ahead. After all, what could go wrong? In order to pursue the county-wide vision, the AATA invested big. Over a three-year period, they spent $463,499.66 of Ann Arbor millage money. The rest of the $1,418,890.15 cost for consultants, survey research, promotional materials and “outreach” was borne by Federal and state funds. See spreadsheet from AATA here. The effort to get the cities of Ann Arbor and Ypsilanti and Washtenaw County Board of Commissioners to sign off on both the four-party agreement and the Articles of Incorporation was longer and much more tedious than hoped. But finally, on September 5, the BOC approved the AOI (account by the Ann Arbor Chronicle). The AATA immediately (September 7) approved their 5-year plan and launched the countywide plan. This would presumably lead to starting a 30-day clock for local units to opt out, after which the 196 board could be seated. 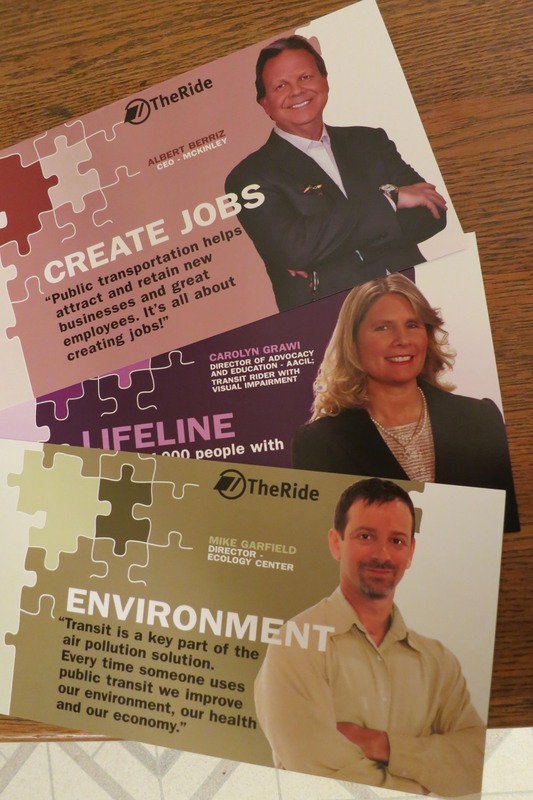 A very thorough campaign was conducted through the u196 members and their associated District Advisory Committees (staffed by u196 members and AATA staff) to convince communities to support the countywide effort. It included postcards to be sent to elected officials and drafts of emails, letters to the editor, Facebook posts, and letters to officials. The objective was to build a public pressure to get local governments to sign onto the countywide plan. Next: So how did that work out? Note: Posts on this subject and much reference material is on our Transportation Page. 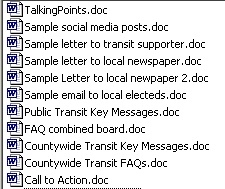 This entry was posted on December 27, 2012 at 10:54 pm and is filed under civic finance, politics, Transportation. You can subscribe via RSS 2.0 feed to this post's comments. You can comment below, or link to this permanent URL from your own site.